Run and maintained by the committee of Local forest dependent community Known as Palaruvi Vana Samrashana Samithi with technical and financial support by Thenmala Ecotourism Promotion Society. 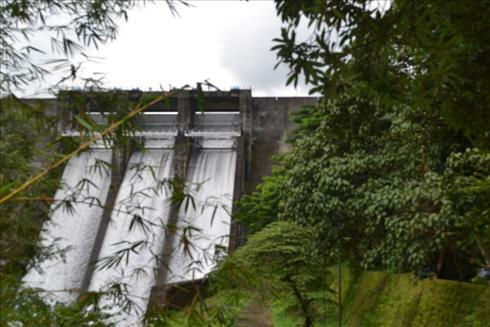 Thenmala (Parappar) Dam was constructed under the the Kallada Irrigation and Tree Crop development project. 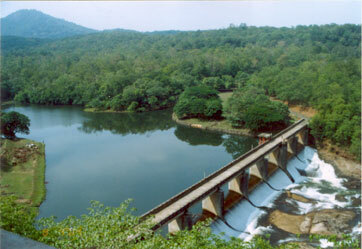 It is the second largest irrigation project in Kerala (India). The dam impounds the longest reservoir in the State. Waters from the reservoir is now used for power generation also. The irrigation can of the Kallada Irrigation Project commences from this vier. Two canals namely the left bank and the right bank commences from this vier. A watch tower enables the vistors to have a panoramic view of the landscape. The bridge, sandwiched by the Kollam - Senkottai National Highway at one side and the River Kazhuthurutti on the other, offers a visual fete at a length of 102.72 meters and 5.18 metres height. The bridge was built on 13 arches. 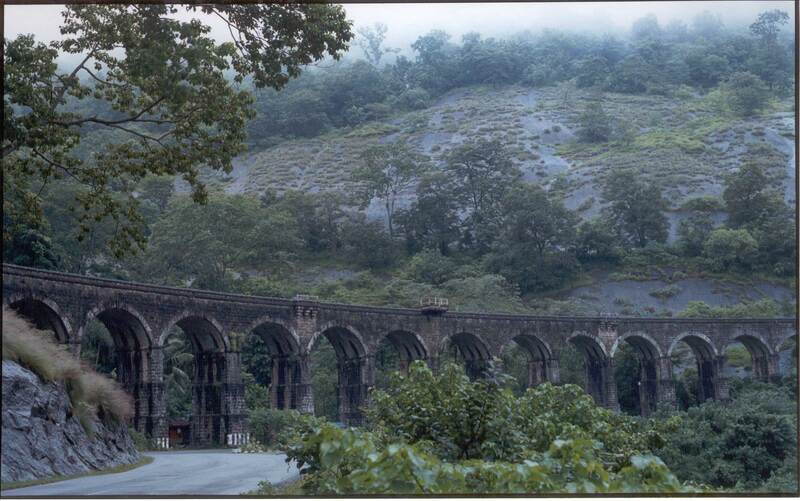 This Bridge holds one of India's oldest mountain rails enroots to Thenmala - Aryankavu. This was once used as the major trade route between Quilon (Kollam) and Chennai. As the climb reaches the top, you find a rocky outcrop, with two pedestal rocks on the northern side and a temple towards the south. The place has few caves on its eastern flank, and these are believed to be used by the Pandavas, during the time of their exile. Rosemala Village is 26 km from Thenmala. 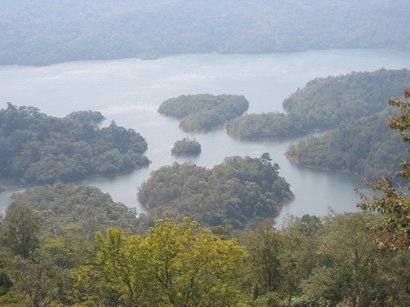 A village separated due to the formation of reservoir adjoining the Shenduruney Wildlife Sanctuary. Situated on a forest range on the Thiruvananthapuram – Shenkottai road, Kulathupuzha is known for the Sastha temple. The Vishu Mahotsavam in April/May is the most important festival. There are frequent buses from Kollam to Kulathupuzha. The Thenmala railway station is just 10 km from here.The Sastha Temple at Kulathupuzha is very ancient. The idol at Kulathupuzha is called ‘Manikandan’. 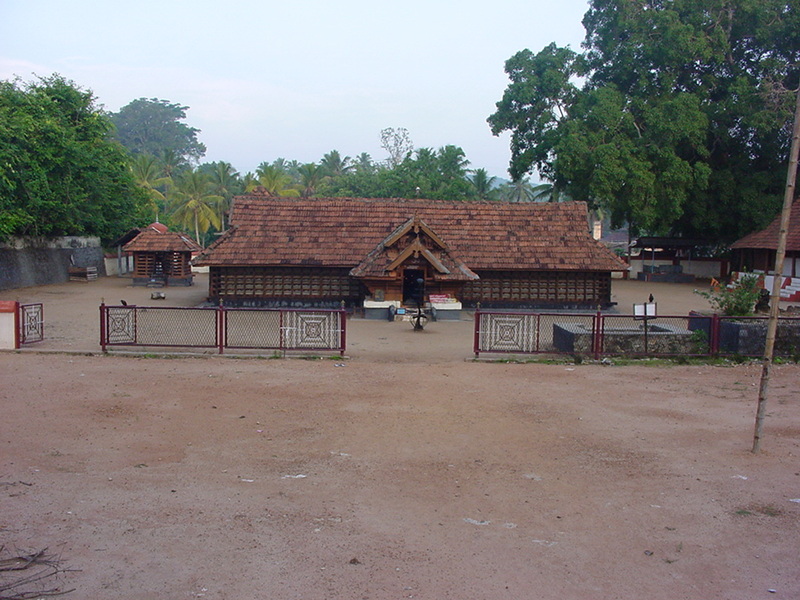 It is believed that the Temple was constructed by the Raja of Pandalam. But the idol was discovered by a Brahmin from Kottarakkara after several years and he started pooja there. The King of Kottarakkara heard about this and constructed the present temple. Feeding to the fishes in the nearby river is an important ‘vazhipadu’ in the Temple. The Ayyappa Temple or Sree Darma Sastha Temple at Aryankavu is one among the four most important temples dedicated to Lord Ayyappa in Kerala. The shrine at Aryankav is known as Aryankavu SasthaTemple and Lord Ayyappa is depicted as a teenager here. Ayyappa is known as Tiru aryan here and therefore the place got the name Aryankavu. Surrounded by forests, the temple is located on the Kollam – Tenkasi National Highway. Just like in Sabarimala, women from the age 10 to 50 are not allowed inside the Aryankavu Ayyappa Temple. The rituals and pujas followed at Aryankavu Sastha Temple is that of Tamil tradition. The sanctum sanctorum of the temple has idols of Devi, Shiva and Sastha. A young Ayyappa sits in the middle with Devi on the left side and Shiva on the right side. The festival at the temple is celebrated during the the Sabarimala Mandala Kalam. The most important festivals observed here include Pandiyanmudippu, Trikalyanam and Kumbhabhishekam. Sree Darma Sastha Temple is one of the important pilgrim centers of the district. The main attraction of Aryankavu is the Ayyappa Temple alias Aryankavu Sastha Temple dedicated to Lord Sastha, one among the five ancient Ayyappa temples. The unique feature of the temple is that it is built about 35 ft below the road level and has some fine structure and mural paintings. The legend behind the the Ayyappa of Aryankavu is similar to that of Sree Dharma Sastha of Sabarimala .The only difference between the two are that Sastha was brought up by the Pandi Raja of Madhura and not the Raja of Pandalam.The two main festivals of this temple, Mandala pooja and Thrikalyanam festival, celebrated in December draws thousands of pilgrims. It is believed that Swami Ayyappan married Shri Pushkaladevi of Sourashtra community in Aryankavu. The marriage festival is held every year in Aryankavu and the marriage rituals are according to the Sourashtra community .Even now Sourashtrans reach here in groups during the time of ‘Mandalapooja’. Situated about 73 km east of Kollam and 33 km from Punalur and 21 km away from Thenkasi and 13 km away from shencottah .All trains towards Shencottah have a stop at Aryankavu. 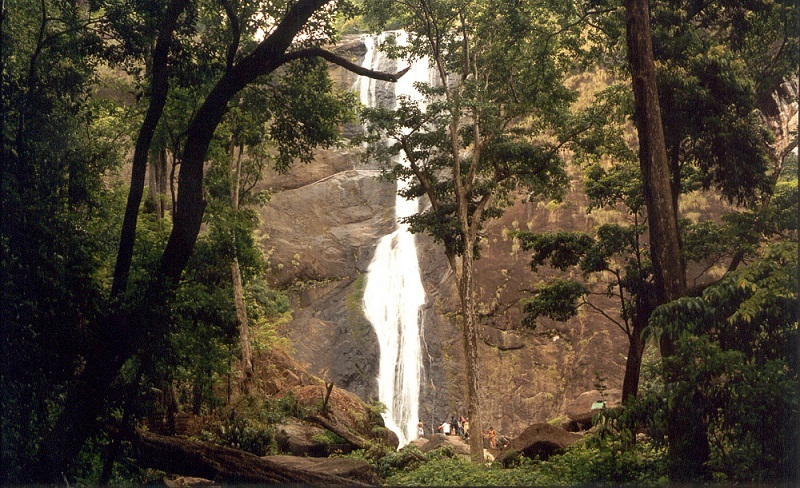 The Palaruvi waterfall is only 4kms away from here. Achankovil Shastha Temple, or the Dharmasastha Temple, is one among the five important temples dedicated to Lord Ayyappa in Kerala. 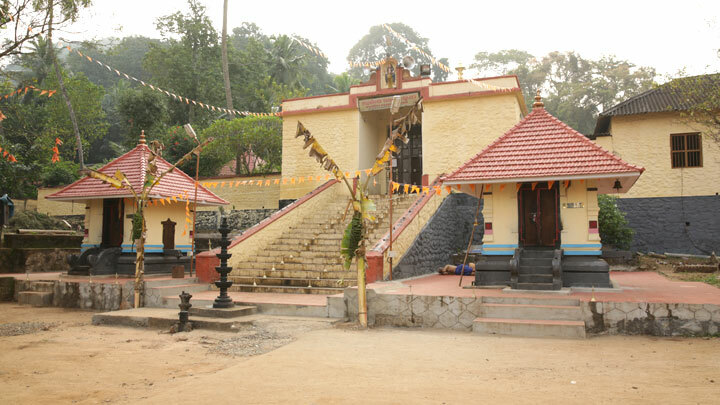 Lord Ayyappa leads the Grihastha Ashrama life here – he is depicted as a family man or leads married life here. He is depicted along with his two wives – Purna and Pushkala. It is believed that the idol here was installed by Lord Parashurama. 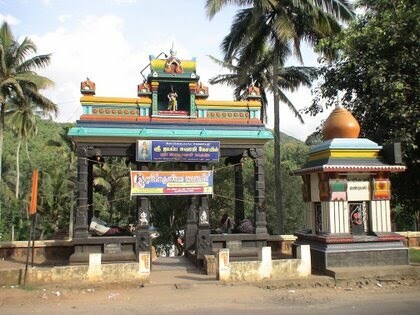 The Achankovil Sastha Temple is famous for curing poisonous snake bites. The left hand of the idol of Ayyappa at Achankovil Shastha Temple always holds ‘Chandan’ (sandalwood paste) and Thirtha (holy water). The Chandan and Thirtha are considered to have medicinal properties to cure snake bites.The temple complex also contains other deities associated with the Ayyappa legend. The festivals and rituals held here have strong Tamil roots During the Sabarimala pilgrimage, devotees also visit this temple to offer their prayers. It is believed that the idol of this temple was consecrated by Sage Parasurama. On both sides of the idol, Poorna and Pushkala, the consorts of Lord Sastha are also installed.The most important festival here is celebrated from the first to tenth day of Malayalam month Dhanu (December – January). Sanjeevani Vanam (A Medicinal Garden) Sanjeevani Vanam Medicinal garden at Kulathupuzha is one of the best and prestigious enterprises of the Kerala Forest Department which was established in 1988 under World Bank scheme. Total extent is 18.8 Ha which comes under Yeroor reserve in Punalur Forest Division. 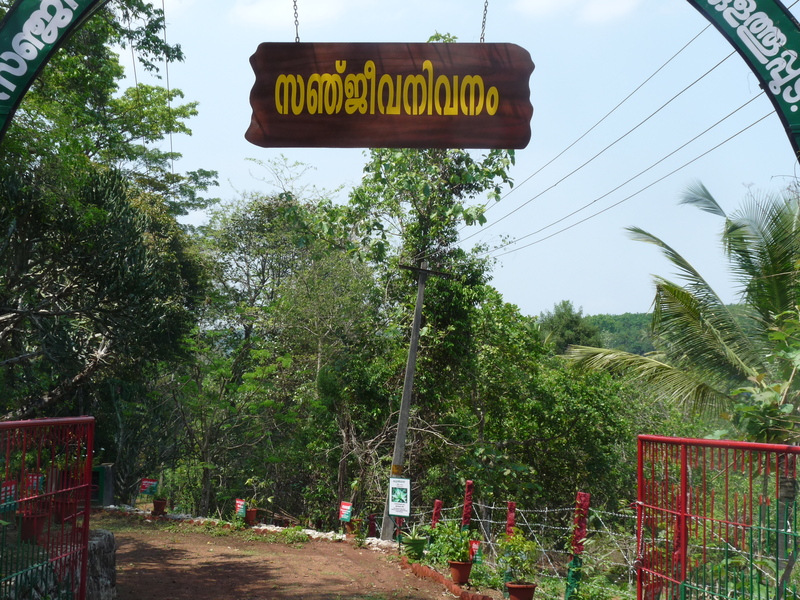 The garden is located at Kulathupuzha, along the right side of Kulathupuzha – Thenmala road. Out of 18.8 Ha. , 5 Ha earmarked for various medicinal plants as demonstration plots. In another 5 Ha area augmentation work was carried out by planting trees having medicinal values like Kudampuli. The remaining area is left as preservation plot with trek path so as to provide a glimpse of natural semi evergreen forest to the visitors. Visitors can relax under the cool pleasant atmosphere prevailing in the area. About 400 species of medicinal plants and trees are conserved and maintained in this garden. Most of the species are rare, endangered and having utmost medicinal value. This medicinal garden is also a special attractive place of environmentalist, students and public. This garden offers an opportunity for identifying medicinal plants and creates awareness about the rare medicinal species to the visitors and there by spreads the message of importance of the conservation of these plants species and biodiversity. About 415 demonstration plots are here in the garden and an inspection path is also formed in between the demonstration plots which enable the visitor to reach each and every demonstration plot with ease.